Deployed on military surveillance aircraft. 4 front removable canisters for easy swap. Supports 6 front removable HDD or SSD 2.5” drive carriers. Interchangeable powers supplies between ground AC or Aircraft DC power supplies. 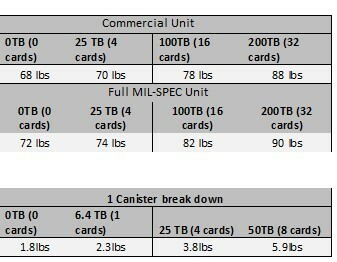 Supplies high-density PCle NVMe flash, up to 256TB RAW * as larger drives are released we will support higher capacities. Dual Haswell motherboard with: Two E5-2680v3 12-core, 2.5GHz Embedded CPUs 1TB DDR4-2133 memory (512GB per CPU), 2 dual port Mellanox InfiniBand cards. Power 3 Front hot swap Power Supply N+ 1 hot-swap power system. Interchangeable powers supplies between ground AC or Aircraft DC power supplies. per axis each direction (a total of 18 shock pulses) (Lifetime exposure). 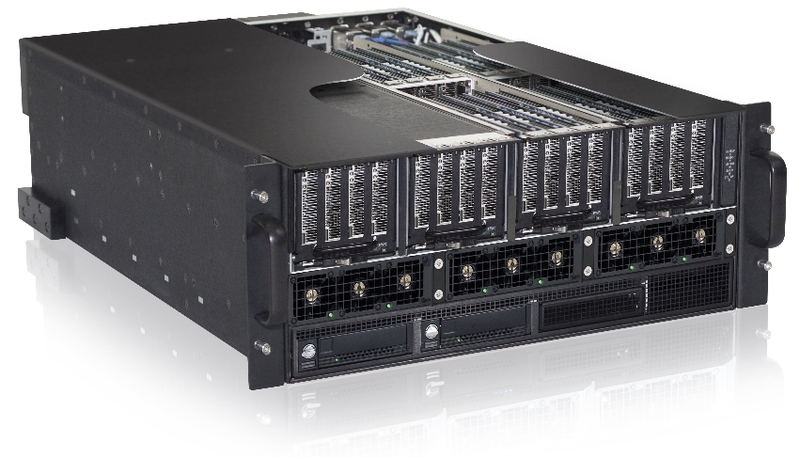 * As newer larger PCIe drives capacities become available to the market we will support larger drives.